FantasyLiterature.com recently reviewed BCS #100, our celebratory double-issue featuring Richard Parks and Garth Upshaw, as part of their Magazine Monday column. I believe this is the first time they’ve reviewed BCS. They enjoyed all four stories, so much so that the reviewer said she immediately started digging into back issues of the magazine. Very glad you enjoyed it! Thanks very much for the review. BCS #99, featuring our 200th story, and #100, our milestone double-issue, were reviewed last week by Locus online review Lois Tilton. She had good comments on all six stories, including her rare “Recommended” rating for one. Of “How the Wicker Knight Would Not Move” by Chris Willrich in BCS #99, she said “a nicely-done fable. I like the conclusion... quite a lot.” She called “Fox Bones. Many Uses.” by Alex Dally MacFarlane a “tale of courage against heavy odds... The use of fox bone magic is for the most part well done”. In celebration of our 100th issue, it’s a double-issue, featuring a novelette by Richard Parks in an ancient Chinese setting, and stories by Garth Upshaw, Christie Yant, and newcomer Amanda M. Olson. It also has an audio fiction podcast of Chris Willrich’s story that was in BCS #99. Adventures Fantastic, who last year reviewed our Third Anniversary Double-Issue, has an early review of BCS #100. “Virtue’s Ghosts” is her first published story. You couldn’t tell it by reading it; I only know that because it says so in the brief author bio at the end of the story. This may have been my favorite solely for the narrator’s voice. Thanks very much for the kind praise! To celebrate the 100th issue of BCS, which comes out next week, we’re giving away a signed copy of a Robin Hobb short story collection. Ms. Hobb, the author of multiple bestselling fantasy series including the Farseer Trilogy, wrote a bunch of earlier works under her real name, Megan Lindholm. The Inheritance and Other Stories includes short fiction written by her under both names, and this copy is signed by her. Your comment will enter you in a random drawing for the book. This giveaway ends Fri. July 27, at midnight Pacific time. The full rules are below, after the More tag. Good luck! Click here to skip straight to the comments. And enjoy Issue #100 next week! I had a great time at ReaderCon this past weekend. I saw many BCS authors, including Matthew Kressel, Mike Allen, Marko Kloos, Rajan Khanna, Margaret Ronald, and Michael J. DeLuca. I also met several BCS authors for the first time, including Ann Chatham and Seth Dickinson. I chatted with a bunch of other editors, including Matt Kressel, Mike Allen, and Sean Wallace, which I always enjoy. One of my favorite editors to chat with, Neil Clarke, had a heart attack at the con, which was a big shock, but he was recovering well at a hospital right down the street; excellent news. The Saturday panel I moderated on Genre Magazines in the 21st Century featured some great discussion about interesting aspects of current magazines, and my solo reading on Sunday included excerpts from four upcoming BCS stories, such as “Ratcatcher” by Garth Upshaw that will be in Issue #100 next week, and the new Lord Yamada story by Richard Parks that will be in our Fourth Anniversary Double-Issue in October. I passed out a bunch of flyers with the Issue #100 artwork by Raphael Lacoste and postcards for the new Ceaseless Steam anthology. And I met many readers and writers, who had great praise for the new website and the recent milestones of our 200th story and 100th issue. Thanks very much to all of you. BCS will be at ReaderCon, in north Boston, again this year. Saturday at 11 AM, I will be moderating the panel Genre Magazines in the 21st Century. It includes a bunch of longtime editors, like Neil Clarke, Shawna McCarthy, and Gordon Van Gelder, a group which nicely spans both older paper magazines and newer online ones. “What goes into keeping genre magazines fresh and afloat in current times?” the program book muses, also mentioning “success and cautionary stories.” I’ll have some good discussion questions laid in. And Sunday at 11 AM, I have a solo Reading, where I will read a story from Beneath Ceaseless Skies. Audience’s choice! Including older stories, current ones, and even forthcoming ones from Issue #100 or our Fourth Anniversary Double-Issue this Oct.; stories from the new Ceaseless Steam theme anthology and even from the not-yet-announced Best of BCS Year Three. I’ll have flyers featuring the new Issue #100 artwork by Raphael Lacoste and postcards for Best of BCS Year Two and Ceaseless Steam. Feel free to drop by the Sat. panel, the Sun. reading, or to stop me in the halls (or in the bar! :-) ). Starting with BCS #97 next week, and running through Issue #100 in July, BCS will have new cover art: “Knight’s Journey” by Raphael Lacoste. 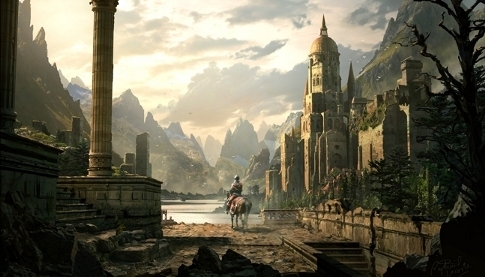 Raphael’s art has been in BCS before, and has been featured on novel covers like Paolo Bacigalupi’s “The Windup Girl” and in games like Assassin’s Creed and Prince of Persia.